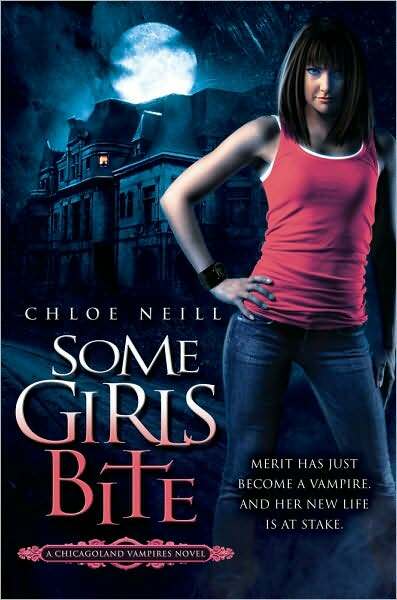 Review: Walking across campus one night, 27 year old University of Chicago graduate student Merrit is attacked by a vampire. Her life is saved by 400-year old Ethan Sullivan, Master Vampire of one of Chicago's 3 vampire houses. Merit is happy to be alive...although she is decidedly unhappy about becoming a fanged one herself. She learns to adapt to coming a vampire and all of the life change, including a sensitively to sun, a newfound taste for blood, an end to her academic career and an intense attraction to Ethan. Meanwhile, Merit realizes someone is out to get her. Could it be a human who is not happy that vampires are now "out" in the world? The vampire who attacked her initially? 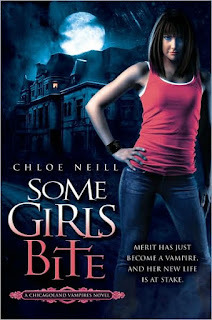 'Some Girls Bite' was a fun read for someone looking for a new supernatural series. In addition to vampires, we are introduced to shifters and sorcerers which could prove promising as the books continue. While Merit is somewhat unbelievable as a former Classics graduate student (we are constantly reminded that she is studious however she appears anything but) she has potential as a lead character. I was not a fan of Ethan in this book as a main love interest as he is written extremely wooden and devoid of personality, so I hope Neill explores his characters more in future books. Overall, a decent read.